Islanders on South Uist have taken control of their estate in Scotland's biggest ever community land buyout. The estate, which was owned by a sporting syndicate, has changed hands in a £4.5m deal. The transfer has taken place amid storms battering the Western Isles and police warned that winds could gust to 70-80 mph. 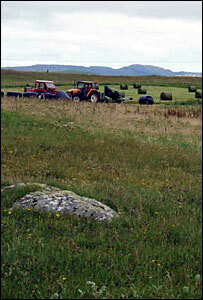 The 92,000-acre area accounts for nearly a quarter of the Outer Hebrides land mass. Angus Macmillan, chairman of the buyout group Storas Uibhist (Gaelic for the store or wealth of Uist) said a detailed agreement in principle had been reached which allows the purchase to proceed. It has sparked celebrations across the estate. Mr Macmillan said: "I thank the directors and shareholders of South Uist Estate for their constructive attitude throughout the negotiations. "This is an important day in the history of South Uist and I look forward to the community pressing ahead with the projects and estate management that will benefit the people of South Uist in the years ahead." Storas Uibhist has six projects it wants to tackle. They include trying to provide more affordable housing, renewable energy schemes, transforming Lochboisdale into a port of access to South Uist and improving drainage and coastal management. Group treasurer and chartered surveyor Martin Matheson said the buyout would spark a regeneration of the estate. The father-of-four said: "We all want to live here and we all believe this is the place to be to bring up our families. "There is a study which was commissioned by the World Bank to do with how you regenerate run down areas and the single biggest factor in allowing economic, social and environmental change is through a change of land ownership from private to public. "That is what we are doing." Sarah MacEachen, 29, a group director, said she hopes the buyout will encourage more young islanders to stay in the area, or return from the mainland. She said: "This is a major step for me and for the youth in general around here. "It means that we are going to have more opportunity to come back and in effect stay rather than have to go away." The Gaelic education development officer added: "A lot of young people go away for education and then don't come back to the islands." The Big Lottery Fund and Highlands and Islands Enterprise have contributed funding and money was also raised from an international appeal. Storas Uibhist also took out a £26,000 bank overdraft so that the purchase could go ahead on St Andrew's Day. The community hopes to benefit from potentially lucrative shooting, mineral and fishing rights. South Uist is also home to a golf course designed by legendary player Old Tom Morris. It is proposed to restore the Askernish course to its original 1892 layout. Assynt crofters were the first to take control of the land they lived on with the purchase of the 21,000-acre North Lochinver Estate in Sutherland about 13 years ago. The residents of Eigg, Gigha, Knoydart and now South Uist are among many communities who have followed Assynt's lead. Politicians have applauded the latest community buyout. Rob Gibson MSP, the SNP's land spokesman said: "The SNP welcomes the liberation of 850 crofters from a private landed syndicate. "Wherever crofts were made populations clung to their land. 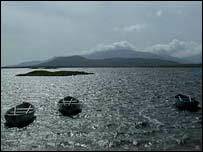 Now South Uist, Eriskay and Benbecula can forge an independent, prosperous path."